Here's a look at some of our editors' favorite stories from our latest Northeast print edition. New York Gov. 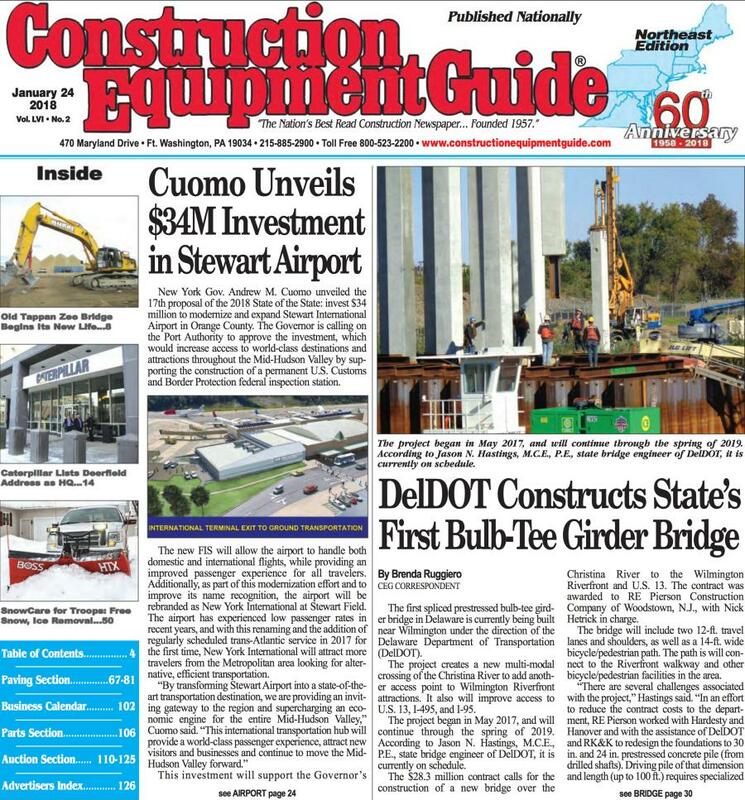 Andrew Cuomo is pushing for the state's Port Authority to approve his recently announced $34 million proposal to renovate Stewart International Airport. The modernization and expansion plan includes a rebrand and a new name—New York International at Stewart Field. If approved, this project would also provide direct access to worldwide destinations directly from the Hudson Valley and would provide support for construction a permanent U.S. Customs and Border Protection inspection station. A new Delaware bridge will be the first spliced prestressed bulb-tee girder bridge in the state. The $28.3 million bridge, which will span over the Christina river, will connect to the Wilmington Riverfront and provide additional access to roads like U.S. 13, I-495 and I-95. The bridge will contain two travel lanes, as well as a path for pedestrians and cyclists. The Maryland Department of Transportation State Highway Administration has completed repairs on the MD 355 Bridge ahead of schedule. The bridge was damaged in December 2017 when a trash truck hit it in an accident. Construction crews worked for 12 hours a day in cold weather to first stabilize, and then repair the bridge before carefully testing it. Trinity Place Holdings Inc. has secured a construction loan worth $189.5 million to build a 300,000-sq.-ft. building in Manhattan. The building will be the new home to 90 condominiums and a public school. Ninety-three percent of the hard costs of the project have been bought out and will be managed via a gross maximum price in the construction contract. The remnants of the old Tappan Zee bridge will soon become part of a redevelopment site in New Jersey. Crews from Burke Construction are hard at work crushing concrete from the bridge to build up a flood plain four to eight ft. In order to make the job a success, Burke Construction needed a Nye mechanical pulverizer to crush the debris before spreading it across the site. The company was able to get one through National Attachments of Gorham, Maine, the exclusive Nye Manufacturing dealer in the country.